A settlement conference has been scheduled in the sexual harassment lawsuit filed against school board member Manny Martinez, according to court records. Attorneys for Toyreh Blacknell and the Community Charter School of Paterson are expected to meet at the federal courthouse in Newark on Jun. 18, a month before petitions are out for Martinez to run for re-election, to work out a potential settlement agreement in the case. Blacknell, who worked as a substitute teacher at the charter school, accused Martinez, an administrator at the same charter, of making unwanted sexual advances in her lawsuit filed in Dec. 2017. Allegations in the case have nothing to do with the Paterson Public School District. Martinez was re-elected to serve on the district’s board in 2016. Some of Martinez’s detractors have suggested the Community Charter School of Paterson which is owned by the New Jersey Community Development Corporation (NJCDC) is moving fast to settle the case before the November school board elections. Martinez has worked at the charter school for almost 10 years. He serves as director of community schools for $74,000, according to payroll records. Charter officials said late last year the board of trustees may take personnel actions against Martinez as a result of the lawsuit. The school conducted an investigation into the allegations after the lawsuit was filed. Palmore did not respond when asked for the findings of the school’s investigation. John Badagliacca, attorney representing both Martinez and the charter school, said he is not authorized to comment on the case. Robert Salaman, attorney for Blacknell, did not respond to a call for comment on Monday. Blacknell alleges in her lawsuit the harassment began when she started working for the charter school’s after-school program in Jan. 2017. She began working as a substitute teacher in May 2016 before becoming a permanent substitute in Sept. 2016 for a $40,000 salary. In the after-school program, Blacknell reported directly to Martinez. Martinez allegedly made a series of sexual comments. In one incident, Martinez allegedly paged Blacknell to his office to tell her she looked “beautiful” on that day. “If I didn’t have these blinds in here, you never know what might happen,” he allegedly said to her in his office. Also, she alleges the sexual harassment included unwanted attempted touching. On multiple occasions, Martinez allegedly tried to hug her slightly below the waist only to be told to keep his hands off, according to the lawsuit. Blacknell complained to school officials, but little was done against Martinez, according to the lawsuit. She was instead terminated from her role in the after-school program as retaliation. “Me and you, we’re not working out, we’re not getting along,” Martinez is said to have told her when he terminated her, according to the lawsuit. Martinez has called the allegations in the civil lawsuit “baseless” and “false.” Blacknell did not file any police reports of the incidents. There are no criminal charges against Martinez. Blacknell’s allegations has had serious consequences for Martinez. For example, he was expected to assume the school board presidency in Jan. 2018, but the allegations against him foreclosed his bid. At a recent board meeting, an upset parent demanded to know why Martinez, who he described as a “pervert,” remains on the city’s Board of Education. Martinez was absent at the public meeting. The angry father was removed from the meeting by security. Martinez had formed a committee to potentially run for mayor, but this too was dashed by the allegations. 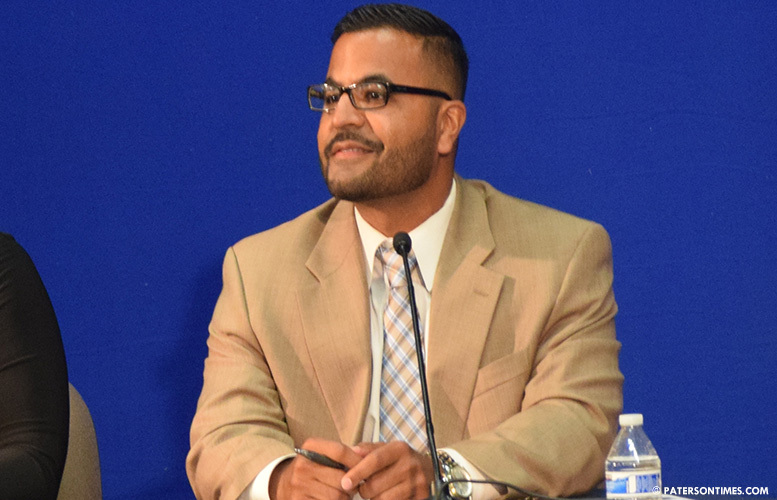 Martinez’s name has been floated to lead mayor-elect Andre Sayegh’s transition team. However, this is unlikely due to the allegations against him. Very concerning that he is still in our schools with our children, if there is any truth to this. He’s Dominican. Of course he did it. My child goes to the Charter School and I must say I have never seen any of this to be true. Mr. Martinez is an exceptional person and cares so much about the children and the school. I don't see any of the allegations to be true. He has already been removed from the Spruce St campus because of the allegations and all the children there miss him tremendously.